Dentsply Celtra Duo delivers exceptional performance, including optimized balance of translucency, fluorescence and opalescence, reduced crystal size which serves to increase flexural strength, and a fine micro structure for processing speed efficiencies. 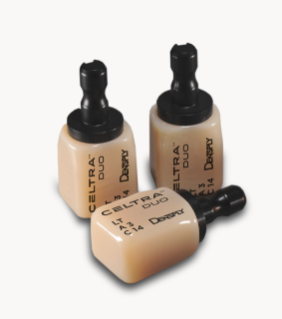 Celtra Duo is a new generation of high-strength dental ceramic and defines a new class of material referred to as “zirconia-reinforced lithium silicate ceramic”(ZLS). In the addition to lithium oxide and silicon dioxide, Celtra contains approximately 10% zirconium dioxide (ZrO2) in highly dispersed form in the glass phase of the ceramic. This prevents crystallization of the zirconium oxide, lends this new class of materials its high transluceny and opalesence and avoids the more opaque look one is used to zirconium oxide ceramics. Furthermore, the highly dispersed ZrO2 content generates considerably more nuclei for forming the crystallization phase and already encourages the formation of crystallization nuclei at lower energy input due to its more favorable thermodynamic parameters. This tends to result in a greater number of smaller crystalites rather than fewer larger ones, which is why the glass phase of the ZLS glass ceramic is present at a higher ratio when comapred with conventional lithium disilicate ceramics. The formed crystals are significantly smaller than those in lithium disilicate ceramics. Celtra Duo offers the possibility of no post firing, allowing the restoration to be finished faster. Simply polish to a high-quality luster. If post fired the flexural strength(MPa) goes from 210 MPa to 370 MPa. If you would like more information on the Celtra Duo material please click here!